When you launch Alfred's preferences to the General tab, you'll see a few options you can customise to your needs. 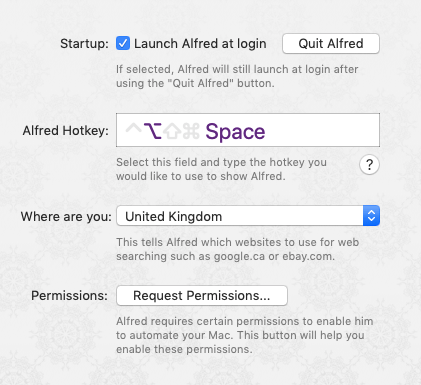 Check the "Launch Alfred at login" if you'd like Alfred to launch automatically when you log in to your Mac. It's the best way to ensure Alfred's always ready to serve you when you need him! By default, the default hotkey to show Alfred's search box is ⌥ Space, but you can change this to another key combination you find more memorable. If you'd like to use Cmd + Space, take a look at this troubleshooting page on using Cmd + Space. By setting your location, Alfred can use the most relevant websites for your location, such as your local Amazon or Google site, if it's available. If your country isn't specified, choose the "International" location. If you're installing Alfred 3 for the first time and you want to import your settings from Alfred 2, follow the migration guide to import your existing preferences. At the bottom of the preferences, you'll find ways to keep in touch with us. Sign up to our newsletter, or say hi on Twitter. You'll also find a link to download Alfred Remote from the App Store.